There’s a belief in public relations that measuring our work is expensive. Lack of budget is frequently cited as the reason for lousy measurement. But the bigger cost of not measuring the success of your work is to your organisation’s performance - and your own development. A new measurement framework using digital technology to help the user through a step-by-step process was launched today by AMEC at its International Summit on Measurement in London. The Framework shows how to implement Barcelona Principles 2.0, linking organisational objectives to communication objectives, to outputs, outtakes, outcomes and organisational impact. The Framework measures across all PESO channels. AMEC is launching the Framework with a comprehensive website of resource material. 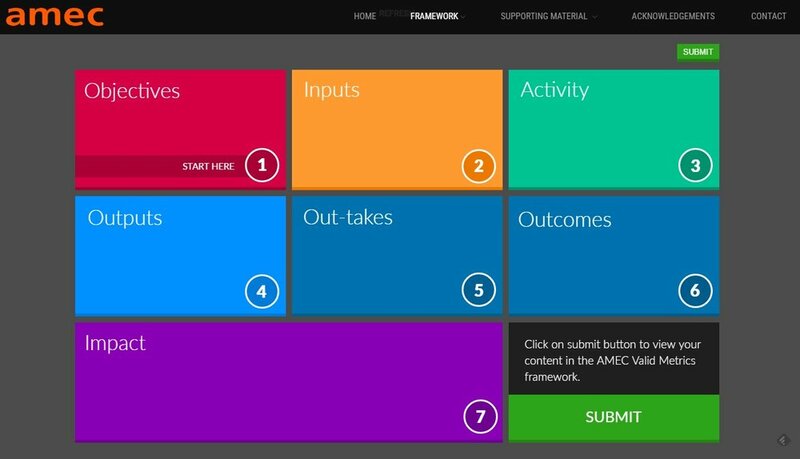 The new AMEC Framework has been developed as an interactive tool to deliver a step-by-step user process with tool tips for information and follow-on resources for the use r. The digital team at LEWIS created the tool as a pro bono initiative on behalf of AMEC. The public relations measurement business has been built on traditional media metrics. These are no longer fit for purpose. At best they represent a poor proxy for business performance. As practice shifts from traditional media as the primary form of public relations engagement, to a variety of digital and social media, the business is getting smarter at measurement. Paid, earned, owned and share media all leave an audit trail that can be interrogated. Our opportunity is to define robust objectives, outputs, and outcomes for a campaign, and then to overlay AMEC’s measurement framework and tools. We now have access, unlike ever before, to data sources and tools to measure outputs, and outcomes. The challenge is that data is frequently buried in silos within an organisation. Departmental budgets and political demarcation take priority over demonstrating performance. I would urge you to move around the silos within your organisation, and dig it out the data. Public relations needs to work with customer service, marketing and human resources. Here are 30 places that you can seek out data within your organisation as the basis of a robust measurement framework. Like – this is frequently a vanity metric of social media but useful as an indicator if there’s a correlation to another intermediary or an organisational outcome.